Digitization of the rope marking's black and white interface occurs pixel by pixel using the point feature editing tool. The influence of humans, especially commercial fisheries, presents a significant threat to marine mammals. Marine mammals may become entangled in fishing gear and subsequently die as a result of an infected entanglement wound, starve because the gear may prevent feeding, or drown due to the fishing gear restraining their ability to breathe. Marine mammal stranding networks across the United States seek to find answers to why marine mammals die by examining the carcasses that wash ashore. GIS is increasingly being used in nontraditional ways. This study, conducted by the National Oceanic and Atmospheric Administration's National Ocean Service (NOAA-NOS) and the College of Charleston located in Charleston, South Carolina, documents the application of GIS for marine mammal forensics to determine the types of fishing gear that may cause entanglement. Photographs of entanglement wounds on bottlenose dolphins were examined and analyzed using ArcGIS 8.1, which is already being used throughout NOAA to manage its spatial data. Gear is often fishery specific; therefore, delineating wounds caused by a specific gear type may facilitate the investigation of a fishery potentially responsible for an entanglement. Stranded animals are often examined internally and externally through autopsy procedures to determine the cause of death, especially if the source of mortality appears to be human-related. Internal indications of possible marine mammal entanglement in a fishery may include a stomach full of fish remains, froth in the lungs and bronchi indicating asphyxiation, or subdermal hemorrhaging beneath the site of a wound. Externally, fishing gear may leave marks on the epidermis of entangled marine mammals, providing a clue to the potential source of mortality. Wounds on entangled marine mammals vary in pattern and width depending on the type of fishing gear responsible for entanglement. Nets used by fisheries may cause hatch marks along an entangled marine mammal's body, monofilament lines may cut off appendages or severely lacerate the body, and ropes may leave broad areas where skin is rubbed off. To model the types and patterns of wounds associated with different fishing gear, particularly fishing lines, an experiment was conducted to mimic wound impressions that may be seen on entangled animals. Digitized map of double style braiding. Commercial suppliers (Rocky Mount Cord Co., Rocky Mount, North Carolina; Wellington Leisure Products, Madison, Georgia) and the National Marine Fisheries Service (NMFS, Southeast Regional Office, St. Petersburg, Florida) donated samples of rope varying in diameter, braiding, and material for use in this study. The rope samples were dipped in paint and pressed upon a canvas board to obtain a rope marking, or "rope signature." The imprint that a particular braiding style leaves on the epidermis of an entangled marine mammal is unique to each type of rope. Digital images of the rope markings were taken and imported into Adobe PhotoShop. The digital pictures of each braiding style were converted to grayscale images, and the contrast/brightness of each picture was adjusted to 100 percent contrast to obtain a black and white representation of each marking. All images were saved as JPEG files and imported into the ArcMap application of ArcGIS as new shapefiles using the ArcCatalog application. 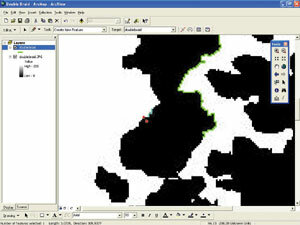 The editor tool in ArcMap was used to create new point and segment features that outlined the black and white interface of the shapefile. Once the base layer (rope marking) is removed from the view, a signature map remains, which can be superimposed onto pictures of entanglement wounds. "GIS enabled us to produce maps outlining the impressions that a particular braiding style would make in the epidermis of an entangled animal," says Leslie Burdett, biological science technician (NOAANOS). "I used these maps to match braiding types to entanglement wounds from photographs of dolphins that stranded in the past." The digitized outline of the black and white interface of each JPEG image was scaled and overlaid onto photographs of wounds from the historical entanglement cases in an effort to match a braiding scheme with a wound pattern and to match the type of line that may have contributed to an entanglement wound. Marine mammal stranding networks commonly have archived photographs of historical stranding cases. Many of the historical pictures were not digital; rather, hard copies of the photographs were scanned into the computer. "Matching the braiding types to the historical photos was challenging," says Burdett, "because details of the pictures were difficult to see due to factors such as an inappropriate exposure level, the angle at which the picture was taken, a lack of measurement scale, and basic obscurities that result from scanning. Our experimentation with this technique indicates that pictures taken during necropsies should be at a 90-degree angle to the wound, include a scale for measurement, and allow proper light to view contrasting aspects of the wounds." Of five photographs analyzed using this technique, there was one successful match (20 percent). The outline of the twisted braiding style matched the impression of an entanglement wound on a dolphin's epidermis. Ideally, this technique will function similarly to fingerprint matching, in which an entanglement wound would have defined physical characteristics that could be matched to a cataloged braiding scheme. Once a match is made, the fisheries that utilize the particular gear type can be further analyzed as a potential source of the marine mammal entanglement. 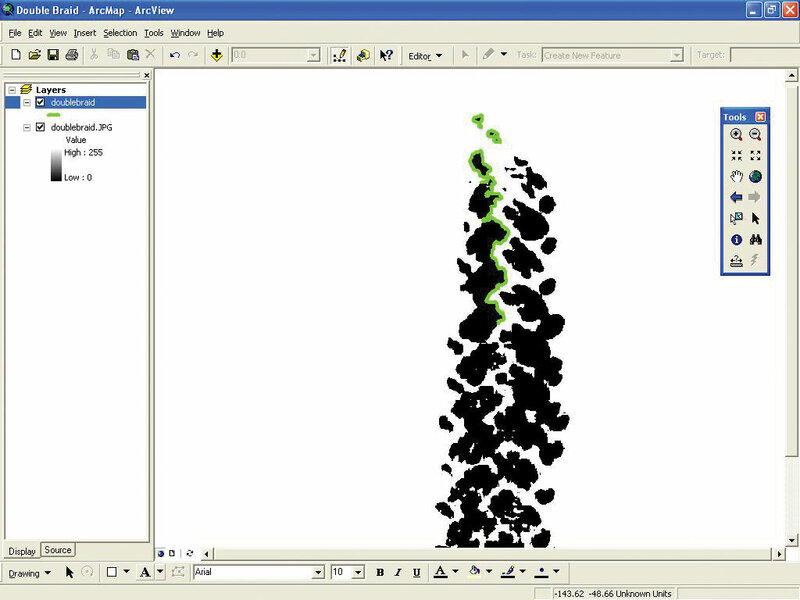 The editor tool allows the digitization of the rope marking's black and white interface to create map delineating the outline of the rope braiding. The map of the marking is then superimposed onto photographs of marine mammal entanglement wounds. "This technology has promising potential to help scientists and managers determine sources of fishery mortality on dolphins that do not have gear attached to them," says Wayne McFee, research wildlife biologist (NOAANOS). "For example, the match between the twisted braiding map and the historical entanglement photograph depicts an animal with entanglement wounds caused by a twisted braided rope. To pinpoint the fishery that may be responsible for the entanglement, only fisheries that utilize ropes with twisted braiding should be examined." This technique eases entanglement source identification because fisheries that do not employ the gear type associated with particular entanglement wound impressions can be excluded from investigation. Combined with fishery data on gear utilized for fishing practices, the ArcGIS maps outlining different braiding style impressions may help pinpoint the potential source of mortality. Ultimately, this method would facilitate management, since definitive matching of entanglement wounds could be associated with specific rope used by fisheries. Thus, some fisheries may be ruled out from regulatory implementation because the specific gear type is not employed. For this study, preliminary results demonstrate the utility of using ArcGIS for marine mammal forensic investigations. Burdett, McFee, and Dr. Cassandra Runyon, associate professor at the College of Charleston, were able to successfully match a braiding style to a historical entanglement wound on a bottlenose dolphin. Further studies, however, should be conducted to support, develop, and validate this method. This study provides a preliminary framework upon which future studies may expand. For example, a database should be created to compare the wounds seen on historical and new entanglement cases with prototype maps created for each braiding style. Also, the widespread use of digital photography will greatly enhance the accuracy of this technique as each individual pixel may be digitized rather than relying on approximations from scanned images. GIS serves as an important analytical tool that can be utilized in various capacities. This study illustrates the potential to combine new technology with preexisting forensic techniques in order to answer critical questions regarding the source of marine mammal mortality. For more information, contact Leslie Burdett, biological science technician, National Ocean Service (tel. : 843-762-8618, e-mail: Leslie.Burdett@noaa.gov); Wayne McFee, research wildlife biologist, National Ocean Service (tel. : 843-762-8592, e-mail: Wayne.McFee@noaa.gov); or Dr. Cassandra Runyon, associate professor, College of Charleston (tel. : 843-953-8279, e-mail: Runyonc@cofc.edu).